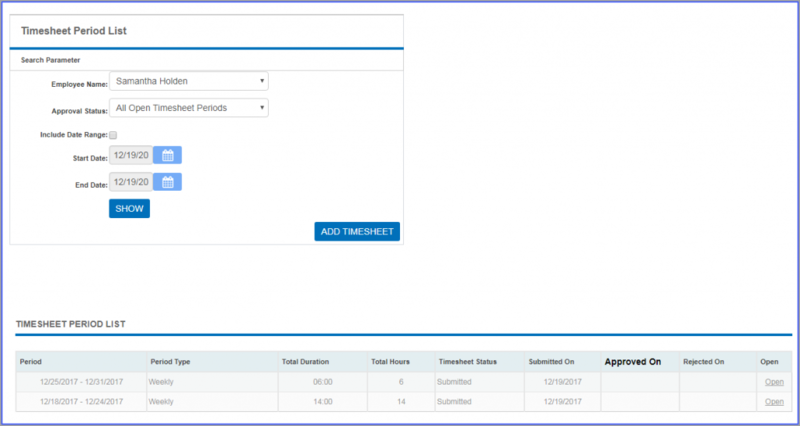 When your timesheet is submitted successfully, by clicking on timesheet period in ‘MyTimesheet’ page you can see the list of submitted, not submitted or rejected timesheets. This page also shows the list of any unsubmitted timesheets that you have. If the timesheet is set for manual approval then this page also shows the “Approved” or “Rejected” status of the timesheet. To enter your timesheet for another “Timesheet Period” or “Day” click on “My Timesheet” in the Menu list. Note: This page can also be reached by clicking on “Timesheet Periods” buttons on the top of your timesheet.